The newly published calendar is so efficient and organized; we thought we would give you some tips on how to access all the information you are looking for! Here is a quick link to the New Community Calendar, or scroll to learn more! Have you ever wanted to only look at the art events going on in the community? Or maybe you want to view all the events that are family friendly but also free? By using the filter bar at the top of our Community Calendar, you can opt to search events in a variety of ways. Search events by selecting (or more) category, venue, cost, and type. The possibilities are endless! No reason to wait for snail mail, you can submit your organization’s events at any time online! Look for the green “Post Your Event” button at the top of the screen. There is no cost or limit to the amount of events you can submit, and you will receive an email update when your event has been approved and uploaded to the online calendar. If your organization has its own calendar, add your calendar feed to ours using the “Add Your Feed” button. If all your online searching happens on your smart phone, you can add a bookmark to your home screen along with all of your other apps – that way you will always have the Community Calendar on hand! If you have already visited our calendar, you might have noticed there are different types of ways to view the calendar. You can opt to search through events at a month, week, or day’s glance, or you can browse through the default view, which includes a photo with every event! You might begin searching for one event, and find yourself interested in dozens of upcoming events. Here is a trick that will help you keep track of your favorite events: When viewing on your mobile device, find an event that you would like to save, press and hold one finger on that event listing, and your will see a small star appear in the right upper corner of that event. Click the star to add this event to your saved searches. (If you are viewing on your desktop computer, hover your mouse pointer over the event, and you will see the same star icon appear in the upper left corner, along with an event description, click to save). Revisit and edit your favorite events as often as you want! Are there too many events clogging up your Saved Searches? We have an answer for you! You can automatically link the Community Events Calendar to your personal calendar (which we recommend if you are always on the go). First select all the categories that you would like to subscribe to at the top of the filter bar. Next, when you scroll down to the bottom of the page, you will see a box in the bottom right corner that says, “Subscribe to Filtered Calendar,” click that box and select the type of calendar you would like to import these events to, and watch the events automatically pop up in your calendar app! Feel free to explore all of the organizational options! And if you have any questions, don’t hesitate to call our office at 270-826-3128. 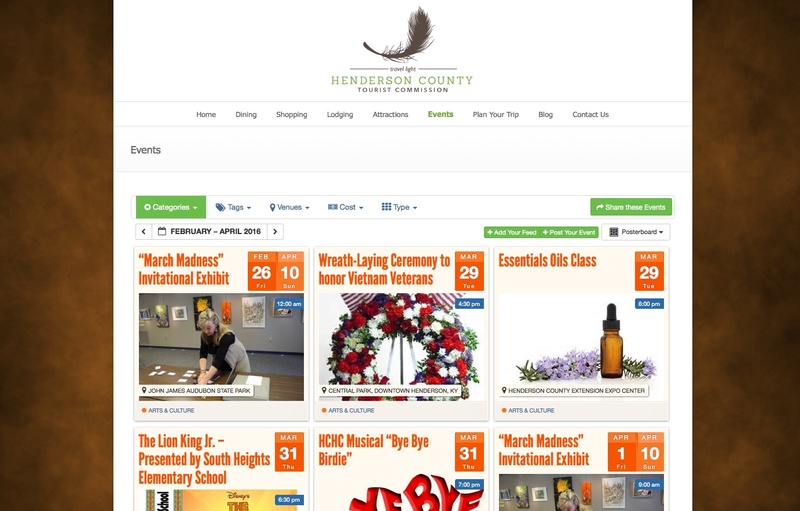 Community Calendar Sponsored by: The Henderson County Tourist Commission and the City of Henderson.